I have a feeling this is going to be a pretty long post so get a cup of tea and snuggle down. 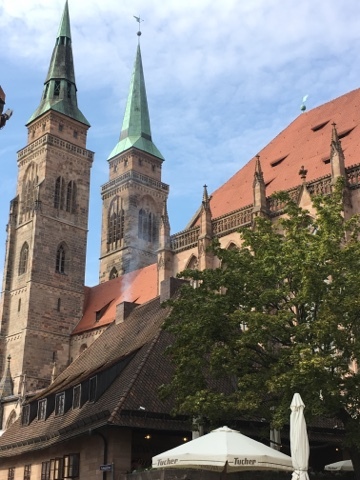 So I've been in Nürnberg for three full days now and what a whirlwind three days it has been. I don't actually know if I can describe the complete mix of emotions that have filled the past three days but I'll give it a go. Stepping off the train in Nuremberg last Thursday I have to admit I was a bit emotional. Not sad but just overwhelmed. I knew Nürnberg was a city but with over 500,000 inhabitants it was a little crazier than I imagined. I didn't know what to expect and after a stressful train journey and running on two hours sleep from the night before I wasn't feeling my best. The area outside the Hauptbahnhof wasn't exactly awe inspiring either. It was pretty intimidating. However after meeting my flat mates I definitely felt a lot more at ease. Despite a sizeable age gap between us all (my 20 years of life vs their 40/50) I have felt so welcomed and I have absolutely loved getting to know them all. Every night we eat dinner together and talk about our days and all sorts of things, which is like a two hour intensive listening exercise but they have been so helpful and understanding at some of the gaps in my German vocabulary so I have felt comfortable enough to just go for it. Who cares if I make a mistake?! Having such small German classes at school and then never quite feeling too confident with my spoken German has meant that if at all possible I will avoid speaking in German. This is something I knew I was going to need to tackle head on right at the start of my year abroad - I am here to improve my German after all! Waking up on my first morning in Nürnberg was a pretty crazy feeling and not only because it was sunny and warm! Without knowing what to expect at all I got dressed and headed out to explore. With a trusty guidebook and map off I went into the complete unknown - I couldn't even remember which way the city centre was. 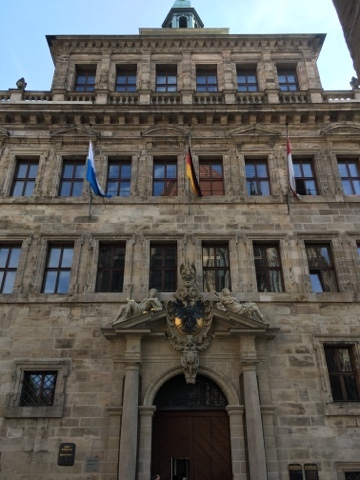 As a prominent medieval city, you can see that great care has been taken to keep as many of the medieval style buildings as possible and the city walls still encircle the centre of the Altstadt (old town) today. 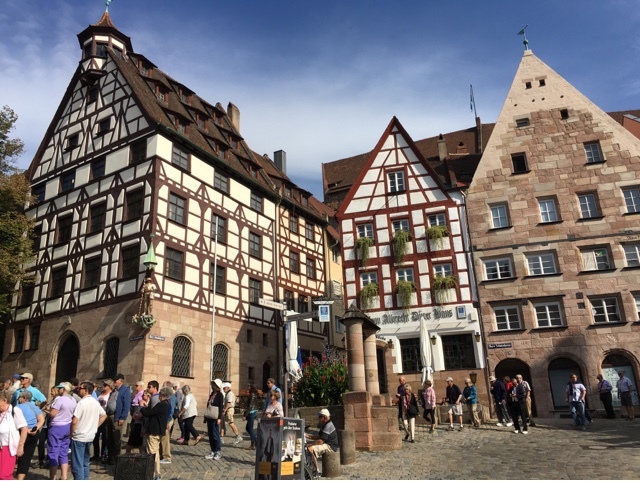 It's almost impossible to describe how magical and beautiful the Altstadt of Nuremberg is so I can only hope my pictures do it any shadow of justice. 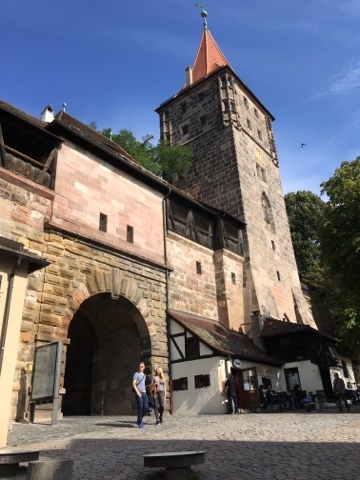 Everywhere you turn there is something else to see, engravings on the side of a building, a beautiful quaint bridge over the river Pegnitz, a traditional market stall selling a huge variety of goodies aimed at locals and tourists alike. 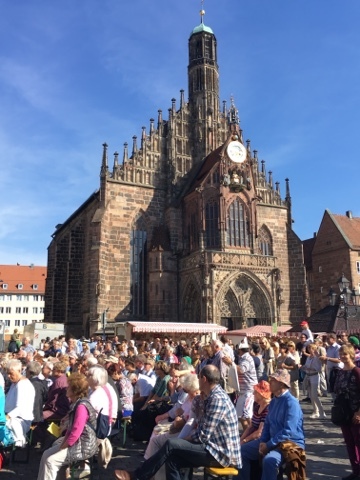 It is particularly busy at the moment as it is the Altstadtfest and the Herbstmarkt (Autumn market) so it'll be interesting to see how much it quietens down here once they are over. I have spent the past three days in a bit of a bubble, wandering aimlessly around in the sunshine with my camera and map and it really does feel like I am here on holiday, something I am definitely going to need to snap out of soon. On Saturday I managed to stumble across a park near the area where I am living which had little metal beds in it! It was just crazy to see people dotted about the park having a nap on the little beds - something which we in Britain definitely need to learn from. I haven't felt homesick once either which isn't strange for me as I am used to going away a lot (boarding school since 13 n all) but there have been moments where I have just wanted someone else to speak English with, or to sit and have a cup of tea and a chat with. It was so lovely on Sunday to meet up with a few other Language assistants in the area for lunch to remind me that I am not alone and everyone is in pretty much the same position. It's going to feel strange, I know there will be times when I am a bit apprehensive but I also know that those feelings will pass and already I am having the best time. 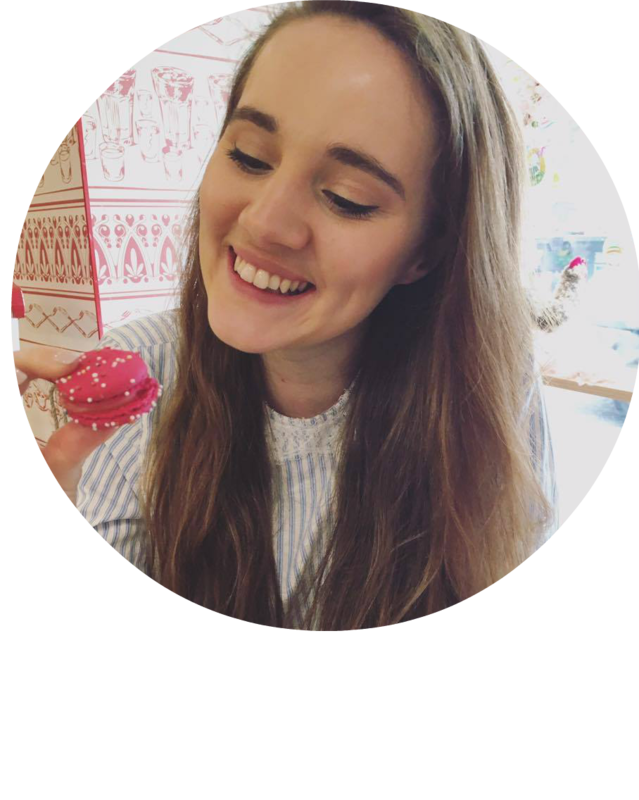 I have tried to limit the photos in this post to just a few because I have a feeling I will be blogging like crazy as I start teaching (Daily 6am alarm is not feeling too fruity) and it actually is just too much beauty to fit into one post. True story. So for tonight, it's going to be an early one from me. Might even explore German Netflix a little more and see if I can find some new series to binge on. I've already picked out my outfit tomorrow and got my new handbag filled with teacher essentials - a notebook and pen. I am definitely feeling apprehensive about starting school tomorrow, as I am teaching in primary schools I really don't know what to expect regarding the level of the pupils English and whether or not I will need to speak to them in German, but we will see.